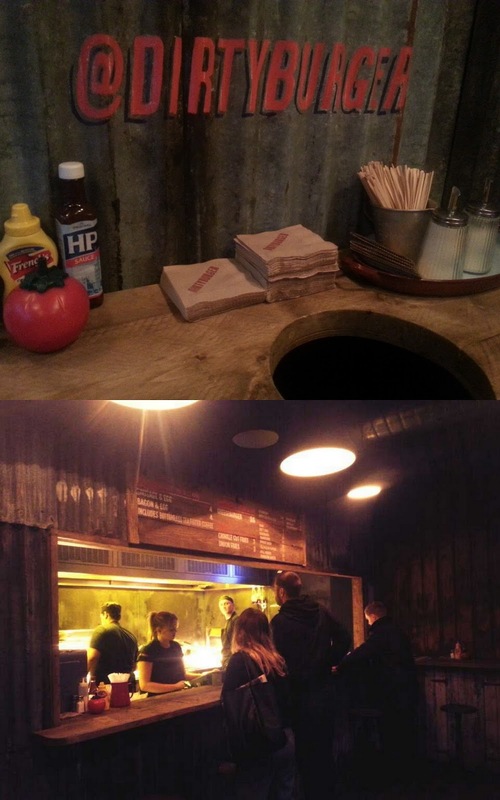 Wednesday 4th September - Team List popped along to the public opening of Grillshack, a new "all day grill" with a quirky technological edge. As well as ordering at the counter, you can place your orders using touchscreens around the room, or by using an app on a smartphone. 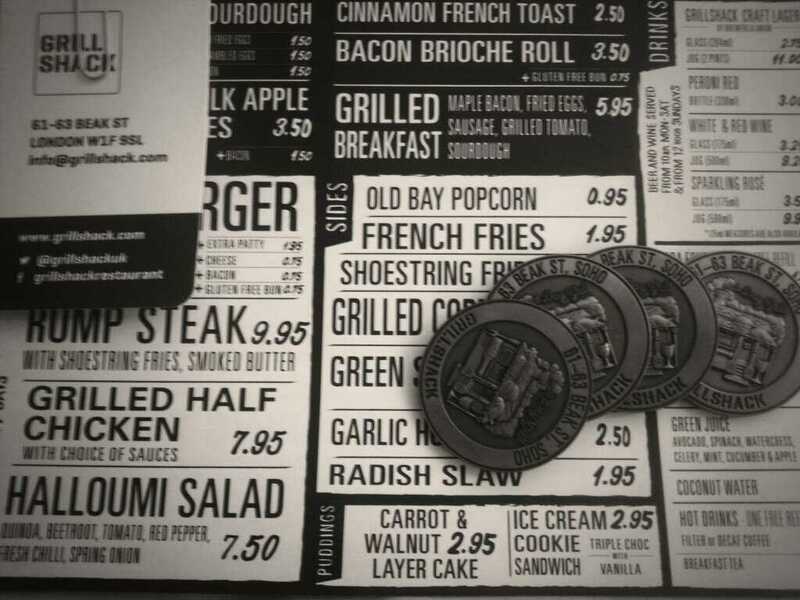 I was sent some attractive Grillshack Coins in the post in advance, worth a free drink or dessert, so I downloaded the app and turned up with Taro and List Leader Natalie for some cheap eats. As there were three of us, we decided to try out all three ordering methods. Taro went up to the counter to order a pitcher of Grillshack Craft Lager (made by Brewers & Union) which unsurprisingly arrived no problem. We were very impressed with this refreshing beer, though it is pretty expensive at £11 for a 2 pint jug compared to everything else on the menu. The wine is particularly cheap at £3.25 for a 175ml glass. You can also have one free refill at the Soda Fountain for £1.95. Let me know if you try the Green Juice -made with spinach, avocado, watercress, celery, cucumber and apple. Natalie went for the touchscreen approach, and was rewarded a few minutes later when her food arrived impressively quickly. That just left me, struggling away with the app on my Android phone. A manager was very quick to notice my hungry expression, and came over to talk through the app teething problems. I first needed to download an update for the app (which had appeared after I entered the restaurant! ), before also joining the Grillshack Wi-Fi network to guarantee a good connection to the tills. She demonstrated how simple it was after that by generously ordering us some sides on the house. I put in my Bacon Cheeseburger order (only £6.45) and had finished it 10 minutes later! The burgers and Taro's Halloumi Salad went down extremely well. Next time, I might have to go for the £9.95 Rump Steak and Shoestring Fries - bargain! The Grilled Corn side with Chipotle Butter and Cheese also sounds tasty. The app allows you to do a couple of fun things. You can order a drink (or food!) over to another table if you want to get someone's attention! Also, you can order ahead if you are on your way and you know which table your friends are sitting at. They have an online waiting list which will text you when a table is ready, so that you can stay in the pub as long as possible before heading over! They also do takeout, although I'm not sure if you can currently order through the app for this, perhaps because they aren't quite sure how they would deal if loads of orders came in at once whilst the diner itself was busy. 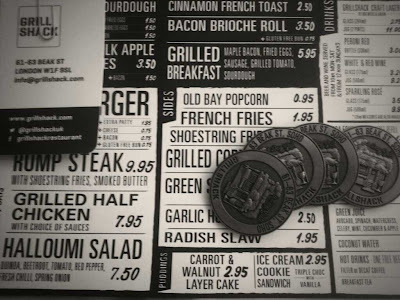 We moved on to dessert, which were all free thanks to our Grillshack coins. 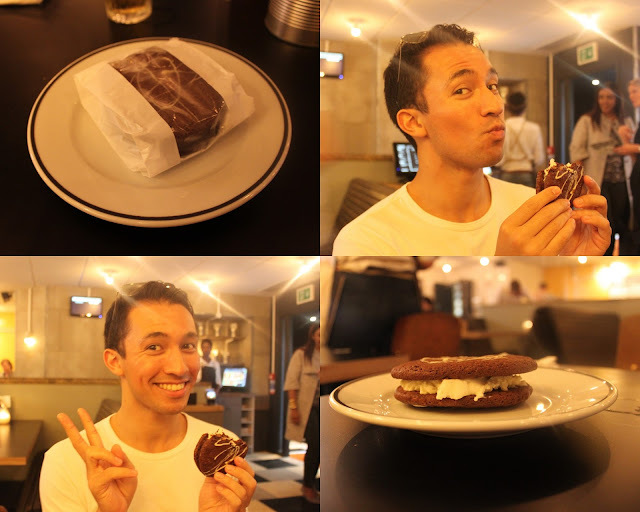 Taro and I went for a delicious Triple Chocolate and Vanilla Ice Cream Cookie Sandwich, whilst Natalie had the Carrot and Walnut Layer Cake. The Ice Cream Sandwich was mysteriously presented in a bag, perhaps because of how it is stored in the freezer, or so that you can take it home with you. Who knows? 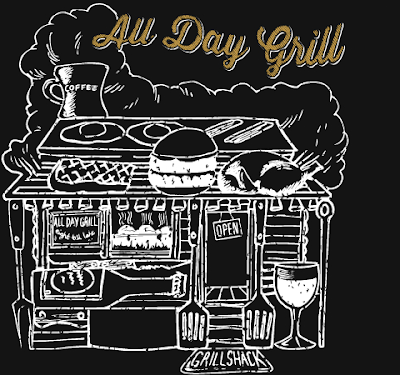 Anyway, we had a great time at Grillshack and the staff were all extremely helpful. If I find myself in Soho at 8.00 am on a weekday, I might pop in to sample their enticing breakfast menu which includes Buttermilk Apple Pancakes and Cinnamon French Toast amongst other delights. It is served from 8-11.30 Mon-Sat, and 10-11.30 on Sundays. The Grillshack team of Mark Askew, Hannah Bass and Richard Caring have already planned their next venture, Jackson & Rye. It will open in December on Wardour Street, and will have the same all day diner style, with an East Coast slant. We decided to squeeze in a drink at LAB Bar before heading our separate ways. Pre 1999, LAB Bar was just LAB - the London Academy of Bartenders. 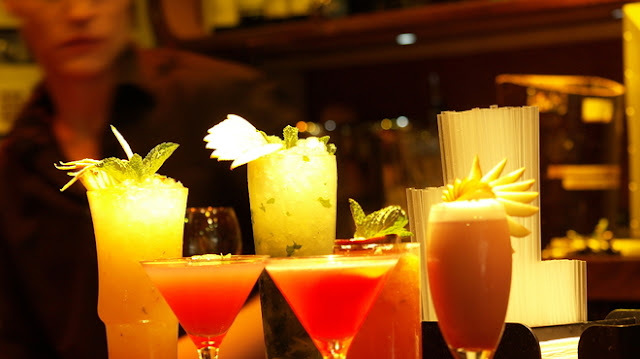 They continue to develop and showcase talented bartenders, testing their skills with a massive cocktail menu full of LAB Bar originals. I am normally put off by such a large menu, but every drink had lots care put into it. 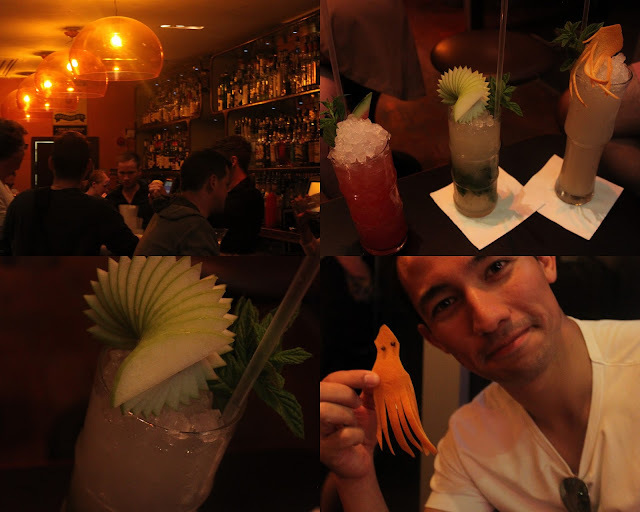 The garnishes were eye catching and the cocktails were spot on. We were incredibly well looked after - there was a tiny mixup whereby I was brought the wrong drink. The names of the two were pretty similar so it was an easy mistake to make, and I wasn't bothered, but they instantly took my drink off the bill! We also joked with our waitress about how one of our orange peel garnishes looked slightly like a squid. A few minutes later she returned with a new sea creature garnish that one of the bartenders had made for us! All this place is missing is a proper happy hour (unless there is one I don't know about?) to help you get through more of the drinks. Most of them are around £8 which is reasonable, but when there are so many on offer it would really help if you could get two every time! Points go to Taro and Natalie for Grillshack and LAB Bar adventures. Wednesday 11th September - Dirty Burger was on my to do list for a long time. I kept hearing wonderful things, but Kentish Town is pretty far away, so I was delighted when they announced that they were opening their second site in Vauxhall, where I work. Hopefully, this will mark the start of a Vauxhall food & drink revolution, if anyone can find any good spaces to set up shop. There are a few fun places around already (Bonnington Café, Estrela Bar, Brunswick House Café) but everything is randomly dotted around. 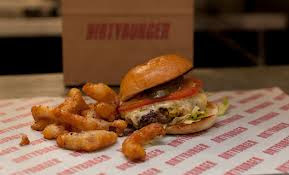 Dirty Burger is more of a fast food joint than a restaurant, and wouldn't look out of place in a scrap yard. I mean this in the nicest way possible, as the tiny shack is made of random pieces of metal, some with locks and bolts still attached. Your main choice has already been made - you are having a cheeseburger (£5.50). Then you can choose onion fries or crinkle cut chips (or both, each is £3), and pick a soft drink, milkshake or even a Brewdog beer. If you want Sausage & Egg, or Bacon & Egg (with bottomless tea/coffee) then go along for breakfast before 11am - it opens as early as 7am on weekdays. So it all sounds pretty simple, and it is. What matters is that everything tastes fantastic. The cheeseburger is streets ahead of your regular fast food fare (including the over hyped Shake Shack and Five Guys in my opinion) and good value. The onion fries are the pick of the two sides but you won't be disappointed either way. Cheap, quick and reliable - it is the perfect pit stop before braving the tube or the train after work, or after a night out. It is open til 2am on Fridays and Saturdays which should draw an interesting crowd in Vauxhall! Thanks to locals Mary & Joe for having everything on the menu with me. Saturday 14th September - One more place with burgers (I know, Mum) to mention. Dip & Flip has recently opened on Battersea Rise near Clapham Junction. If you don't like gravy, this is not the place for you. Nearly everything on the menu either comes soaked in gravy, or has a pot on the side for dipping. Never has a place been more suited to List Leader Natalie, who hails from the Yorkshire "Moo-ers" and is constantly bemoaning the lack of gravy based food in London. 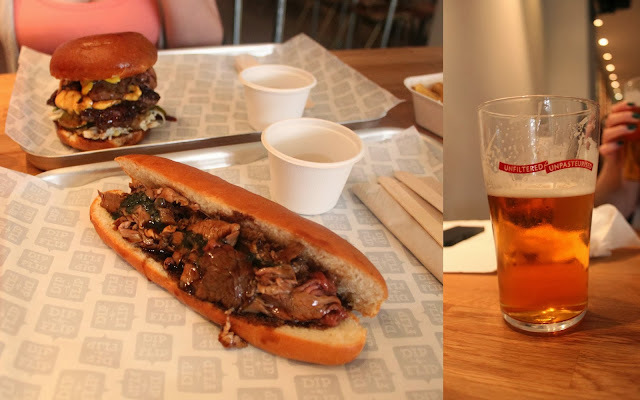 We went for a Lamb Sub (with gravy soaked meat and mint sauce) and the Dip and Flip Burger, a cheeseburger with extra slices of roast beef that have already been dipped in gravy. Both of these also come with a pot of extra gravy on the side. We also ordered some Poutine which hails from Quebec - chips topped with gravy and cheese curds. In Canada, you would find it on a regular McDonalds / Burger King menu. It is a fairly messy meal as you might expect. The Dip & Flip Burger is almost impossible to dip, but it doesn't need it anyway - the beef and the patty are both high quality, and it is pretty soggy already! The Lamb Sub was a better shape for dipping, and was delicious. The lovely mint sauce came through despite lashings of gravy. The poutine was also a great success, and didn't last long at all. The chips were seasoned with chicken salt, which was noticeable but not overpowering. On the drinks front, we both went for the Sambrooke's Pale Ale (who are just up the road, and opening their Brewery tap this Friday - 4th October). It is a rare, carbonated version of the Pumphouse Pale Ale which you can only get in a few places around London at the moment - well worth looking out for. It was a perfect match for our food. There were a couple of bottled beer options, including Samuel Adams, but they are intending to get some more interesting ones in soon. 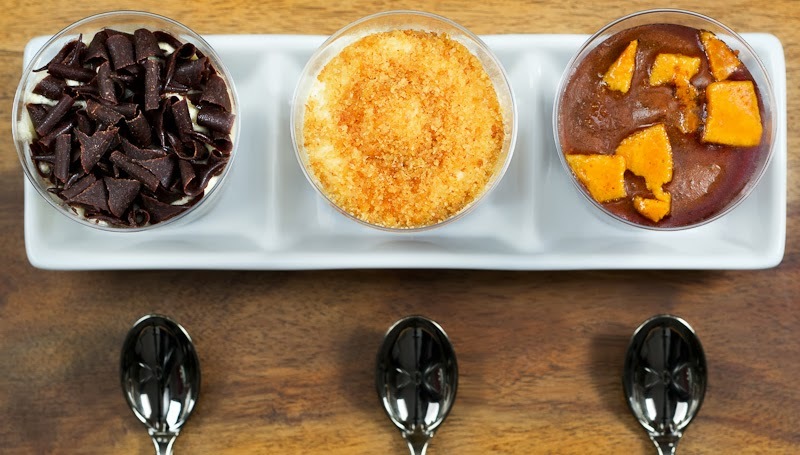 Dessert is supplied by local pudding expert, Laura Amos, who runs The Dessert Deli. Her Mini Dessert Shots were on offer, as well as a Chocolate and Salted Caramel Tart. We went for the Banoffee Cheesecake and Honeycomb Chocolate Mousse shots, which came with teeny little spoons which we were very taken with. They are obviously quite small, and not especially cheap, but they are excellent. After a load of fast food covered in gravy, I wouldn't normally go for a sweet course, so they have made a smart choice bringing in these quirky little desserts with the added bonus of supporting a small Battersea business at the same time. Look out for Laura's Dessert Deli stall on Northcote Road on Saturdays. We were in constant contact with the manager who was very friendly and chatty. His hope is to get a local, hungry crowd in regularly, but never just for drinks. It will serve food right up to midnight Thursday-Saturday to pick up punters from the many bars on Battersea Rise and Northcote Road. I will no doubt find myself there again soon, and I am sure that it will be a lot busier when I return!